In the Spring 2011, we saw dramatic changes at Lemon Street Park and West Poplar Street Playground (Near West Poplar Housing Projects) through our efforts to enrich culture and make visible the former trash filled park. ASI transformed a graffiti covered abandoned bathroom into an outdoor theater stage. ASI collaborated with St. Paul’s Baptist Church parishioners to install outdoor trashcans and promote their use to maintain the natural beauty of the park. 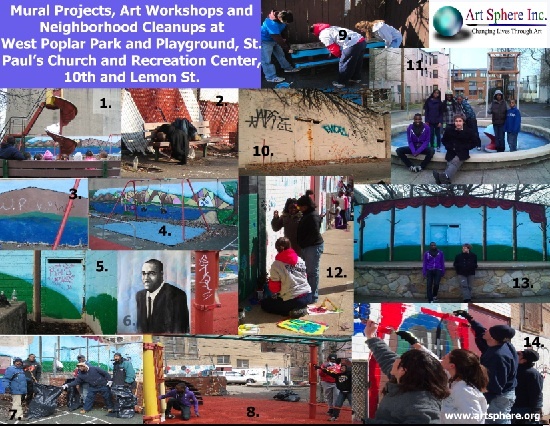 Creative problem solving sets Art Sphere Inc apart from other organizations as we share resources with neighborhoods, empowering them to maintain local public spaces with the support of our artists, teachers and volunteers. 1. ABO Haven Day Care- youth visit the park at 11am, but only use the benches to eat snacks due to too much broken glass and trash in the park for children to play here. Here they watch Alfred (Art Sphere intern and newly trained mural painter) incorporating graffiti into a mural design. 2. Park misuse -By 2:00pm, drinking in the park has started on the same benches the children were sitting only hours earlier. More glass bottles are left at the site and a group of five teenagers accidentally break the glass. There are no trash cans…trash and old leaves are intermixed in dangerous piles around the mural and by playground equipment. 3. Graffiti on Walls- The Park has a series of graffiti including: “W.P.” and “West Pop” on our earlier start of a mural from 2008. The park still has no signs though the neighborhood is called West Poplar. Naming the playground and building neighborhood identity and pride is a good idea we incorporate into our mural. 4. New 2011 Mural- We incorporate ideas of Saturday program passersby and local youth: quilt, basketball and jersey, flowers, and roller skates. We have more student-made stencils to include, but have already made great strides! The park is in much better condition then when we had volunteers clean and paint it in October 2008. Bright colors sure makes a difference in the mural compared to picture 3 taken in the morning! 5. Samples of Graffiti on Walls and Playground Equipment: Bags of 40 oz beer bottles and decayed trash were removed from the park and playground located between Lemon Street and Mount Vernon, 10th and 11th Streets. 6. Portrait of Former Reverend- Our volunteer and PAFA painting grad, Alfred, worked with Saint Paul’s Baptist Church staff on a commemorative mural painting on parachute cloth (installed on entrance by ASI board members P.J. and John) to recognize this important community leader who raised the funds for the building of Saint Paul’s Recreation Center. See this mural installed at front entrance of Recreation center. 7. Saint Paul’s Church Staff, Church members, and Recreation Center volunteers- They volunteered cleaning the park of leaves, trash, beer bottles, and drug paraphernalia that had been accumulating since our last clean up there in 2008. 8. Volunteers Painting playground Equipment- Philadelphia Community College Art Major and volunteer shows youth how to paint. 9. Wood Benches given a New life- Temple University College students painted benches with bright colors to discourage misuse. 10.Former Abandoned Recreation Center- Before photo of abandoned bathrooms with 2011 dated graffiti, “Hard one”, “Fword”, “Reks”, “ABS” “TNT” We couldn’t incorporate these into a youth appropriate mural. 11. Painted Fountain- Local West Poplar youth connect with four cement animals of the once dilapidated water fountain now cleaned of trash and painted. 12. Students from Mrs. Diane’s Saturday Classes- Ongoing Saturday Drawing Workshops with 14 church youth helped us design mural ideas and apply them to the repainting and restoration of the older Martin Luther King Jr. mural as well as others on the backside of the church and recreation center. 13. Lemon Street Trees Outdoor Theater/Stage- See #10 above for the transformation of abandoned bathrooms into an outdoor Theater/Stage with volunteers Kevin and Alfred. There are plans to add acting and music to our Saturday Classes at St. Paul’s. 14. Art Sphere Board Members- All Art Sphere activities are volunteer driven and board members are active volunteers seen here painting the backside of the church and recreation center.